The air was relatively cool and the sky was overcast... It almost seemed like the beginning of fall, and I knew what I had to be done. Off to the river, for a quick trip. 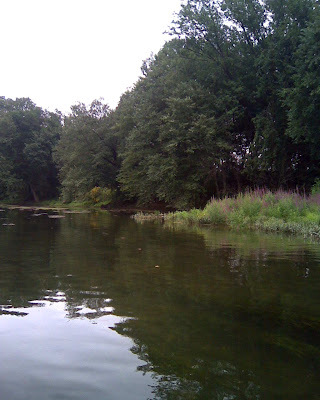 The conditions were perfect for fishing a soft plastic jerk bait--on e of my favorite ways to catch smallmouth. I hadn't fished the Juniata for a couple of months, but conditions were excellent and I was sure that I could scrounge up at least couple of fish. It didn't take long. On my first cast, I was gawking at a large group of kayakers, when I missed a massive strike. I reeled in my bait and found that the tail had been completely ripped off of my soft plastic lure. Bummer! I quickly retied and continued on in hopes of making up for the missed strike. Luckily, my efforts were rewarded. 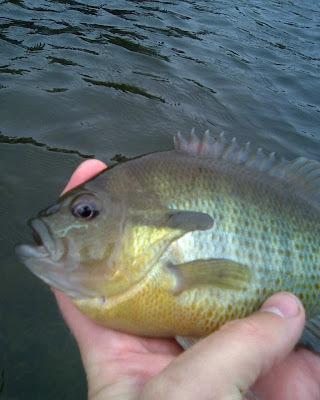 I waded and fished for about an hour--ending up with 3 nice smallmouths, one 16+ incher, and a pretty little sunfish. To be honest, I expected to catch a few more fish than I did... but the quick little trip was still very much a success. It was nice to visit the river again--to wade around the weed beds, feel the gentle breeze, and to take in the summer scenery. Speaking of which, I saw a bald eagle on this trip. It flew overhead about 100 yards away and continued up river. It you haven't been fortunately enough to see an eagle in person, definitely make an effort to see one. They are huge birds, and very impressive to see in flight! Thanks for reading!